Memorial Day weekend is almost here! You may not be surprised to learn that this is the second biggest grilling day of the year (eclipsed only by the Fourth of July). According to the HPBA (Hearth, Patio, and Barbecue Association), 56 percent of Americans will fire up their grills. As for the other 44 percent, well, someone has to bring the beer. What may surprise you is that for some Americans, Memorial Day marks the start of barbecue season. Not for this barbecue community, of course, because even if you live in New England or the Frost Belt, we know that it takes more than a little ice or snow (or even a lot of ice and snow) to keep you from your appointed rounds at the grill. In the unlikely event you haven’t been grilling all winter, click here for ten tips for tuning up your grill. You might also be surprised to learn (I know I was) that Memorial Day became an official Federal holiday — celebrated the last Monday in May — only in 1971. It honors the men and women in our armed forces who gave their lives for our country. Memorial Day originated as Decoration Day — established after the Civil War to honor fallen Yankee and Rebel soldiers. After decorating their graves with flags or flowers, people took to spreading tablecloth or blanket on the grass for a communal potluck meal — the precursor of the Memorial Day Barbecue. On a less sacred but no less celebratory note, the Indianapolis 500 has been run on the Sunday before Memorial Day since 1911. The nation’s largest Memorial Day parades take place in New York, Chicago, and Washington, D.C. According to the HPBA, hamburgers are the most popular dish to come off the Memorial Day grill, followed by chicken and steak. So to help you get ready for your Memorial Day feast, make my Great American Hamburger recipe and don’t miss these tips for the 12 surefire ways to build the best burger! Plus, if you don’t already subscribe to our Up in Smoke newsletter, register now to learn some fascinating burger statistics that will be in our May 28th newsletter, in honor of National Hamburger Day. 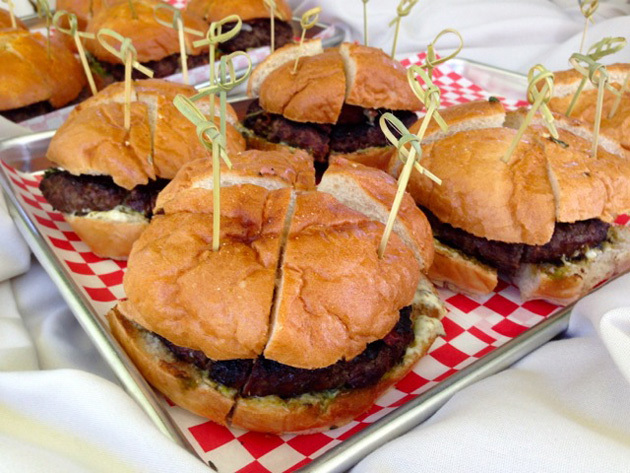 And in an upcoming blog post, I’ll tell you about my experience as a judge in the Sutter Home Build a Better Burger competition, in which a young woman from Brooklyn, New York, won $100,000 for her amazing 7 Train Caramelized Green Curry Burgers. 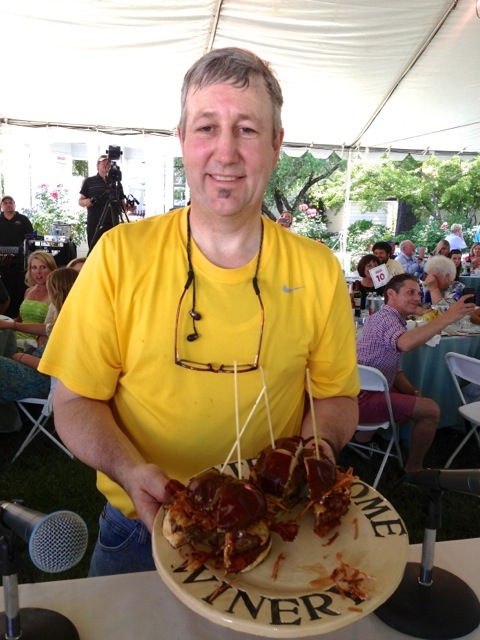 To make you hungry right now, meet Mark Pyne of Troy, Alabama (see photo, below), whose Grilled Green Tomato Burgers with Bad Boy Barbecue Sauce (see recipe for his barbecue sauce, below) won first place in the People’s Choice Award in the Build a Better Burger Contest and came in second place in the official contest. So happy Memorial Day everyone! And while you’re savoring those burgers, chicken, and steak, take a moment to remember the brave men and women who gave their lives so we could grill safe and free today. Combine all the ingredients in a heavy saucepan and whisk to mix. Place the pan on the grill and bring the sauce to a boil. Reduce the heat to low (or move to a cooler section of the grill) and gently simmer the sauce until thick and richly flavored, 7 to 10 minutes, whisking from time to time. Mark mixes some of the sauce (cooled) directly into the burger mixture (1/3 cup for 2-1/4 pounds of ground beef) and serves the rest on the burgers.